The KMOS instrument mounted on ESO’s Very Large Telescope at the Paranal Observatory in Chile. KMOS is unique as it will be able to observe not just one, but 24 objects at the same time in infrared light. A high-tech robotic instrument on the Very Large Telescope in Chile has seen its first light, and the results bode well for the future. 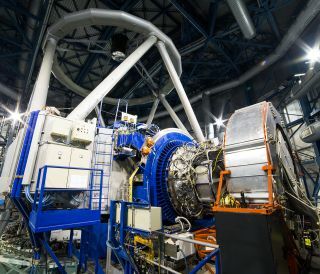 The K-band Multi-Object Spectrograph (KMOS), attached to the Very Large Telescope Unit Telescope 1 at the European Southern Observatory's Paranal Observatory, will help astronomers study the early lives of galaxies, scientists said. The instrument sees in long-wavelength infrared light, which helps to observe distant objects whose light has been "red-shifted" toward these wavelengths as they speed away from us. The KMOS instrument is also special because it can target 24 objects at once, making short work of observations that used to take telescopes much longer to make. “I am excited about the fantastic opportunities KMOS offers to study distant galaxies," KMOS co-principal investigator Ralf Bender of the Universitats-Sternwarte München and Max-Planck-Institut fur Extraterrestrische Physik in Germany said in a statement. "The possibility to observe 24 galaxies simultaneously will allow us to build galaxy samples of unprecedented size and quality. The collaboration among all partners and ESO could not have been better and I am very grateful to everybody who contributed to the construction of KMOS." The instrument uses multiple robot arms that can be positioned many ways to observe, for example, 24 different galaxies at once. Each arm maneuvers a 14-by-14-pixel grid to lie on top of a galaxy, and all 196 pixels collect the light and split it into its constituent wavelengths to study the galaxies' properties. KMOS is an intricate technology, with more than 1,000 optical surfaces that were each manufactured to exacting standards and carefully aligned. "I remember, eight years ago, when the project started how I was skeptical about the complexity of KMOS. But today we are observing and the instrument is performing wonderfully," said Jeff Pirard, the ESO staff member responsible for the instrument. "Moreover, it has been a real pleasure to work together with the KMOS team. They are very professional and we had a great time working together."